The parents of Trayvon Martin have been fighting for their son’s legacy and for racial justice for all since their son was gunned down five years ago by then-neighborhood shithead watchman George Zimmerman in a controversial shooting that fueled the Black Lives Matter movement. 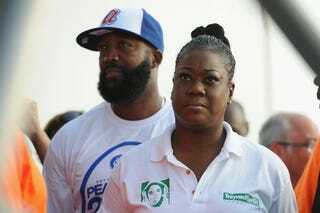 However, now, with a Trump presidency appearing to threaten whatever accomplishments have been made, Sybrina Fulton and Tracy Martin are reportedly considering running for public office to “be part of the change” they think the nation needs. According to USA Today, both parents fear that Donald Trump will reverse the progress that has been made, and they are now looking to change things from the inside out. This position is a far cry from where they saw themselves five years ago “before our life got interrupted,” as Fulton puts it. Both parents laughed heartily when asked if they had ever considered a run for office before now. But things being as they are currently, the sky is the limit, apparently. “It could go all the way up to the White House,” Fulton said of their possible upcoming bids, but she said they would begin with a city or county commissioner position. The duo have a new book, Rest in Power, that is scheduled to be published Tuesday by Siegel and Grau in memory of their son. Now faced instead with the reality of a Trump presidency, Fulton says that she talks to many black parents who are increasingly worried about the safety of their children. “Where is the justice system for some of these families? Where was the justice system for us?” she added.